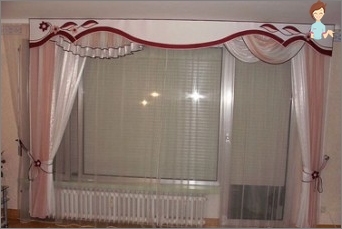 The design of the room curtains are important andto some extent, they define the overall theme of the interior. Today we can find variants with different ornaments, among which are especially popular pelmets. With their help, the appearance and the overall interior concept is complete and original. The shops offer a wide range of suchparts for blinds (see. photo below), but their price is high. In addition, it is difficult enough to choose the option that is suitable for their own interior. In this case, there is a solution - pelmet sew their own hands. 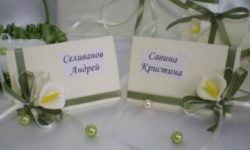 Thanks to simple master-classes you will probably be able to make a decoration at home. How to sew a pelmet SMAD? The elegant decoration, discussed in this master class, ideal for high and narrow windows. This option is most often used in classical interiors. 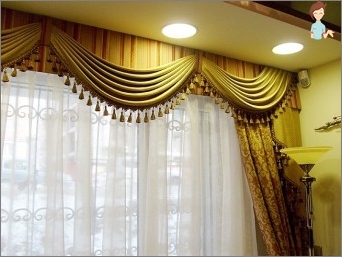 It is worth noting that the SMAD looks great on cascading curtains, as well as on species with a frill. The width of the SMAD (1) - is the length of the circuit board. To find it, you need to measure the length of the cornice. The height of the SMAD (2) - the depth of wrinkles. To measure it is necessary to find the middle of the width (1) and descend to the bottom of the fold point. The length of the arc (3) - indicates the length of the slackfolds. To measure it is necessary to start from the width (1), down to a height B and back again, but in the end (1). Use for measuring the home string. Length cascade (4) - indicates what levelwill fall off the side stages. It all depends on personal preference. Cascade can reach the floor, and perhaps until mid-curtains. There is the classic version, according to which cascade length is three heights SMAD. The width of the stage (5) - to determine it has a formula: 1/3 (1) + width circuit board. no way to do without this item becauseotherwise get the perfect pelmet fail. Take a large sheet of paper or a special tracing paper, intended for patterns. Top draw a horizontal line, and put it on the point A. Do it all on the left side of the sheet. The last point I, to get her to get the middle of the segment AB. To home properly sew pelmets, you need to determine where it will undergo lobar thread. For this draw a small square so that one side coincides with the segment AB. 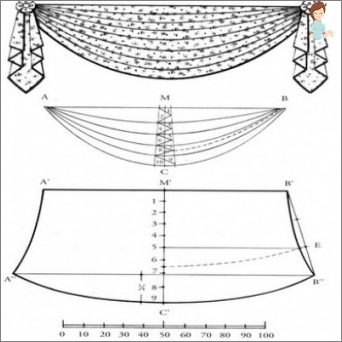 Through the center of the square, draw two diagonal, one of them will be lobar thread. Now, with his hands to do the pattern stage. For this purpose, the first vertical line, where the point A set point J, to the right in the second half of the sheet. J-N = width of the circuit board. From the N lower vertical line, but from the point K draw a horizontal right. In the place where they crossed, put the point O. Fractional thread will pass through the line parallel to J-K. Cutting out the pattern, do not forget about SEAM. How to make the folds SMAD? This light waves on swags make thisdetail of the beautiful and elegant. Through assemblies visually decoration looks bulkier. Transfer the pattern on the fabric. Matter fold in half and measure the fold at a distance of 12.5 cm from the top. The last wave will be at a distance of 10cm from the bottom. Other crease mark equidistant (not less than 10 and not more than 15 cm) between these points. Make corresponding marks on each side. Now with his own hands will do the pattern stage. The folds should form at the top. The first fold should be done at a distance of 12.5 cm from the point L. The segment between the first mark and the point J divide into equal parts of width from 10 to 15 cm. Made patterns will help to understand how to sew pelmets. For a frame of a window, you must have SMAD,stage 4 and the lining. Using all the calculations, you can measure values ​​for the windows in your home, which will purchase the right amount of material. Another important aspect - if you use a fabric with a pattern and fabrics, then keep in mind that he has to get balanced, especially in view of the folds. You're right to attach the mounting board to the pelmet. This type of decoration See the original at anyroom. There are many different options on offer to consider the most elegant of them. So sew curtains with lambrequins openwork. For its production uses Bando - adhesive material to create a rigid framework. Make delicate hard pelmet is not easy, but the result is worth it. To finish the edges, you can use ropes, fringe and other variants of decoration. 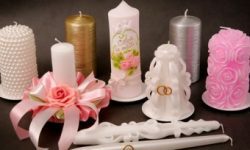 Lace or ribbons for decoration. 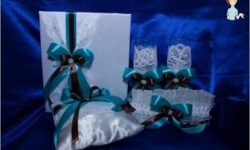 Openwork lambrequins can decorate curtains corners, butYou can also make a figure in the middle of the window that will look no less original. Take the paper and draw on it the desired pattern. It is essential that delicate lines were not too thin. Get the basics you need to move on gangsand cut. Sew pelmet at home, starting with the laying gangs from the wrong side of the matter. Depending on the material used, or simply stick it or walk on it properly iron. Then, from the inside lining of the place and treat the edges of the machine. To improve the appearance and hide the seamUse a cord that can be glued with hot glue. Basically tracery pelmet is ready, it can be Sew on a regular basis, designed for rigid lambrequin. To attach it to the ledge at the top of sew Velcro, stepping back from the edge a couple of centimeters. Thanks to that described in detail the master class inyou should have no problem with tailoring swags. With consideration of the recommendations, it will be possible to easily deal with the other options. A little practice and you can be sure, all will certainly succeed.